Stop dreading math lessons! 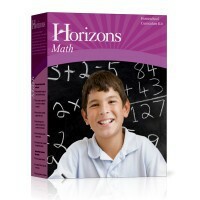 Picture your child enjoying math and finishing assignments in addition and subtraction, multiplication, and decimals with the colorful, best-selling Horizons 2nd Grade Math Set. Highly acclaimed, this proven math course includes 160 lessons within two student workbooks and a two-part teacher's guide. From Alpha Omega. Don't struggle any longer with teaching concepts! With the Horizons 2nd Grade Math Set from Alpha Omega Publications, math concepts are introduced, reviewed, and reinforced for complete mastery. Full-color workbooks and easy-to-grasp math lessons on the Fahrenheit thermometer scale, English measurements, ratios, and more make teaching math to your homeschooler a breeze! This favorite math curriculum of many homeschooling families also includes a teacher's guide that clearly outline lessons 1-160. Comprehensive objectives, needed materials, and suggested learning activities in this Alpha Omega curriculum save precious time in your teaching preparation. Plus, you'll also find the daily homeschool lesson planner, student readiness evaluation test, duplication masters, answer keys, teaching tips, and additional worksheets helpful resources that assist you in providing your child a thorough education in mathematics. In short, teaching math to your homeschooler doesn't have to be difficult.